Enjoying sunny and breezy days relaxing on nature’s wonders is one of the many things to do in Capri. The grand dame of Naples Bay is a well-known paradise island boasting breathtaking pristine destinations and a rich culture with tasteful architecture that exudes a sense of Old Italian grandeur. There are endless things to do in Capri. We take you through some of the most exciting activities to indulge in while on the island even if you only have a 24-hour visit. Nothing says adventure like this stunning beauty. Get ready for a vacation of a lifetime. The lush gardens of Augustus are your one-stop shop for the best destination in Capri. As you saunter through the lust-worthy gardens, you can savor the breathtaking views of Marina Piccola, l Faraglioni and Via Krupp. The vibrant, lush gardens exhibit beautiful floral designs furnished with tasteful historical sculptures, and spectacular flower-decked themes overlooking the expansive blue sea. The Arco Natural is a cozy and cool pristine destination for those adventurers looking for a thrill. Arco natural, Capri’s icon is a majestic 18-meter high limestone natural arc that has been standing tall since the Palaeolithic era. This majestic former grotto collapsed due to a landslide and a section of the roof remnants connected to two pillars of rock. The Arco Natural is an elegant frame with impressive sea views. This prominent attraction should be top of your bucket list. This massive rock structure towers out to the mid sea off the coast of Capri. Take a boat ride around it to marvel at its out-of-this-world features. The l. Faraglioni consists of three mysterious rocks emerging from the sea: Stella with a portion perched on the land. Faraglioni di mezzo cuts off from the land with a massive hole at the center through which boats pass through. Faraglioni di Fuori is the only spot on earth you can view the Italian wall lizard- Pordacis Sicula Coerulea. It is a rare blue lizard species sitting on the rocks. Complete with rich architecture and stunning views of the water, Villa San Michele is perched on the remains of a Roman chapel in Anacapri. It features stunning panoramic views of the island of Capri with historical relics, sculptures and art designs from ancient Egypt and the classical era. The beautiful Villa San Michele is a dual garden and museum with ancient sculptures strewn around the garden like the famous Greek tomb and the iconic granite sphinx which keeps watching over the island of Capri. Wander around the garden and dazzle at the impressive view of the sea with unique birds flapping to a nearby bird sanctuary. Get ready for a vacation of a lifetime. Pack your bags; the grottos are calling your name. Capri is the ideal destination for a boat ride. Rent a boat and tour some of the island’s treasured natural wonders such as la grotto Azzurra (the blue grotto/cave), la grotto Verde (the green grotto/cave) and la grotto Bianca (the white grotto/cave). The Blue Grotto is a scenic place featuring breathtaking views of the stunning glowy blue waters. It is a magical spot on the island famous for its sparkling blue waters tucked away in a cave. The top of the cave has an opening that lets in the sun’s rays to illuminate and enchant the glitzy blue waters. The Green Grotto is a green sea cave famous for its coveted view of the rugged seaside with emerald green rocks and crystal clear waters. The green colored water is as a result of green light illuminating the cave owing to the blue light reflecting from the water bouncing off the yellow tinted rocks. Take a quick swim in the greenish tinted waters of the green cave for the ultimate mermaid-like experience. This expansive white cave features jaw-dropping impressive white cliffs and filled with stalagmites and stalactites hanging inwards from the ceiling. The limestone rocks reflect on the white rays of sunlight. It features a stunning stalagmite at the top of the cave named the Madonna. Fall in love with Carthusia, famous for its intriguing fragrant waters with sweet aromas. Carthusia is a renowned perfume store in Capri decorated with shelves stocked with a sea of luxurious lotions, fragrances, and soap. The preparations are high quality, unique with an Italian charm made of rich ingredients and hand wrapped with love. The soap has delightful fragrances that draw you in like a butterfly on a bright flower. Just along via Vittorio Emanuele beside the Piazzetta, the sweet smells of waffles fill the air and are enough to distract you to follow its scent. In your quest, you will land on a bakery seated on a beautiful historic square selling all kinds of tempting treats. Gelateria Buonocore is the perfect spot for breakfast or an evening bite. It has made its way onto the travelers’ radar and for a good reason. Grab a tasty fruit tart or a freshly baked waffle cone. The gelato is oh so heavenly and simply the best on the island. You cannot visit Gelateria without sampling their wide variety of rich gelato flavors. When in Capri, you need to savor the island cuisine some of the best hotels in Capri. Head off to relaxing seaside waters of paradise on the island’s pristine beaches. Unwind and drift away in the heavenly sands of Capri’s many private and public beaches. One public beach that’s quite a craze is Spiaggia Libera Marina Grande. The resort’s tropical design is a bit of heaven on earth featuring green and blue tinted waters you’d want to dive in and soak in all that beauty. Stop by the Da Gioia restaurant in Marina Piccola beach for some delicious and mouth watering seafood dishes for an authentic island cuisine. If you want to enjoy some private tranquillity make sure you visit Le Ondine and Le Smeraldo private beaches in Marina Grande. You can sit back and enjoy oceanfront dining at the soft waves of crush within earshot. Explore the tropical terrain of the beaches and indulge in the eccentric food for the ultimate exceptional dining experience. 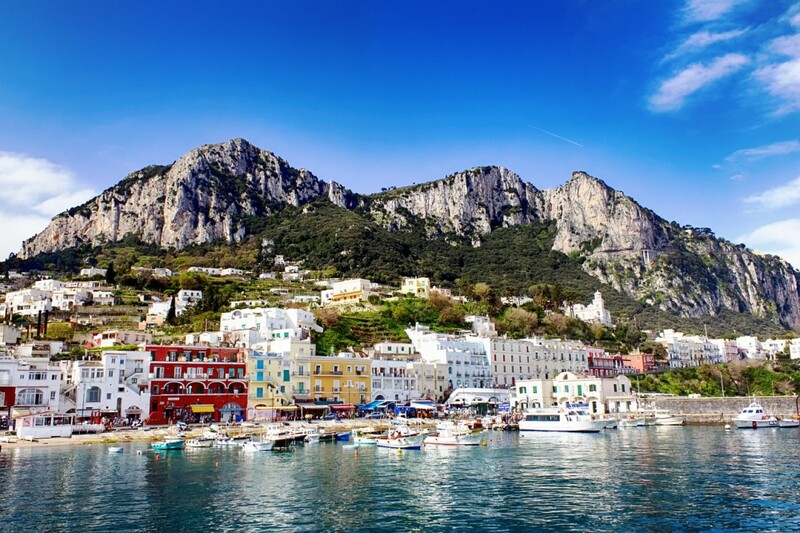 There are plenty of things to do in Capri if you have a very short time to spend there. It’s a majestic city where paradise peeks out from every turn. If you’re looking for more travel tips or want to know more about Italy, be sure to subscribe so you never miss a post. nice blog.it will be very helpful to all, who loves travelling.